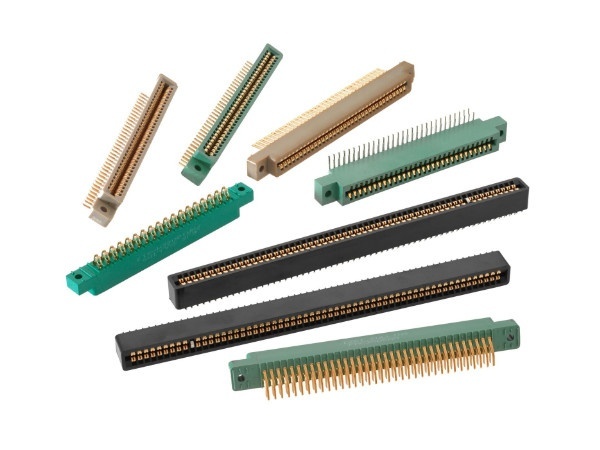 Sullins Connector Solutions full series of RoHS compliant, Hi-Temp dual-row card edge connectors support an operating temperature range of -65 degrees C to +250 degrees C for demanding thermal applications, and are available in 0.039″ (1.0 mm), 0.050″ (1.27 mm), 0.100″ (2.54 mm), 0.125″ (3.18 mm) and 0.156 (3.96 mm) contact centreline versions with 2 to 120pins per row. Engineered to provide unparalleled design flexibility and manufacturing efficiency, parts may be ordered in dip solder, wire wrap, right angle bend, and card extender termination styles, as well as in straight and right angle plated through hole (PTH) and surface mount (SMT) versions. Available mounting styles include clearance holes, flush mounting, threaded inserts, straddle mount, float mount, side mounting and open card slot. Contact plating options include full gold, selective gold and pure tin. Body moulding materials are UL94V-0 rated and withstand reflow processes up to 260 degrees C peak for 120 seconds max. Intended for use in high-density applications where board spacing and total weight are factors, Sullins’ Hi-Temp card edge connectors are ideal in a wide array of consumer, industrial, and commercial applications. They are most frequently used in test and burn-in oven facilities, electronic component testing, communication equipment, medical equipment instrumentation, power converters and power supplies, along with aerospace and automotive systems and products. The Hi-Temp card edge connectors feature a current rating of from 1 A to 3 A maximum per contact. Dual-row card edge connectors are offered with from 2 to 120 contacts per row. These devices are supplied with full gold or selective gold plating options. These parts also boast a high mating cycle of 500 cycles minimum.